After four years of being the number one television show in its genre, Chhota Bheem will graduate to the big screen this Friday, May 18. 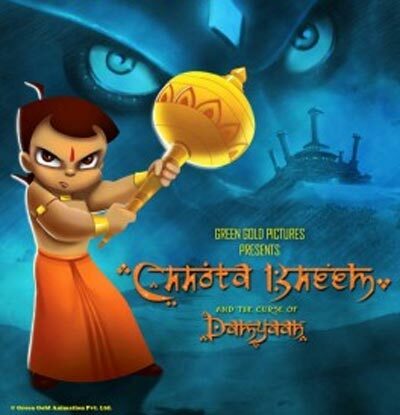 Produced at a cost of 4 crore rupees, Chhota Bheem And The Curse of Damyaan is a 2D animation feature film that its makers, Green Gold Pictures, hope will click big time with the target audience -- the kids. Rajiv Chilaka, managing director of Green Gold and the creator, director and producer of Chhota Bheem, spoke to T S Sudhir about how Chhota Bheem was born and what this film means to the Indian animation industry. 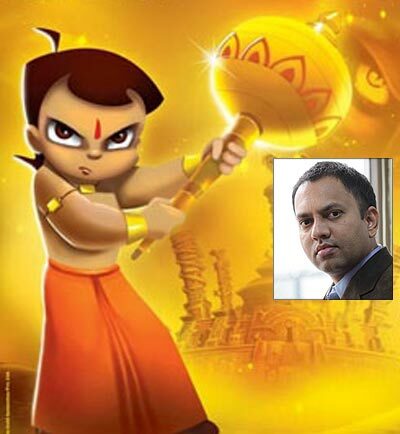 Chhota Bheem is credited with having broken new ground with Indian content in animation on Indian television. What makes you confident that Chhota Bheem is now ready for his next big step? For the last four years, we've been producing Chhota Bheem on television, on Pogo. It has been the number one show. For the last couple of years, we've been contemplating if Chhota Bheem should be made into a theatrical or not. Except Hanuman in 2005, we've seen a lot of failures among animation movies in India. So it was a challenging decision to take. But we somehow felt that Bheem can make a difference. We wanted to make Bheem larger than life. At the moment, Bheem is a household name in India. I think he can be a global character someday. For that, the first step would be to try the box office. How different will Chhota Bheem on the big screen be from Chhota Bheem on the small screen? Chhota Bheem is more exciting on the big screen. The main difference is that there is larger action happening in this movie. There is magic and time-travel, and it is of a longer duration. He is fighting a stronger enemy. Yet again, we showed team work between Bheem and his friends. We have two very peppy songs sung by Shaan. We have all the elements of love, fun, adventure, magic and dance. We are releasing it in Hindi now but we have plans to dub it in other languages too. Children are having their summer vacation now, so in that sense it is obviously a good time. But then this is also IPL season and most film pundits don't like to time their big releases now. IPL and kids don't compete. Also, most IPL matches start at 8 pm, when many people don't venture into kids shows. We have to plan according to what suits us best, not as per others' plans. We felt that let's just do what we have to do and leave the rest to the kids. IPL is definitely popular but I don't think it is as popular as Chhota Bheem is, among kids in the age bracket of four to 14. So we have a good chance of being successful. Usually the big film productions go on a publicity overdrive and carpet bombing of theatres everywhere for the release, so that the recovery of the investment is fast and quick. What is your strategy? We are playing blind. We do not have any expectations from the market. We are prepared to lose everything in this one. Ours is a children's movie. We will not have huge openings like Bollywood films have. Like a Salman Khan or a Shah Rukh Khan would have around 2,500 screens. That kind of a thing might be possible in the future. But as of now, the distributors and theatre owners are keenly waiting to test out what the strength of Bheem is. I think they will find out from this release. The good thing is, Bheem will be there in 200 screens across India, in 20 cities and towns. In terms of animation movies, 200 screens is really a huge release. At the same time, Chhota Bheem is also referred to in trade circles as the Salman Khan of the children's animation world in India. I do believe Bheem is for kids what Salman Khan is for young guys. You expect Salman to take his shirt off and fight, and children expect Bheem to fight. He is already not wearing a shirt, so that makes it easier. Even the girls are huge fans of Bheem. It is very rare for a children genre TV show to have followers among both boys and girls. So we are very optimistic. 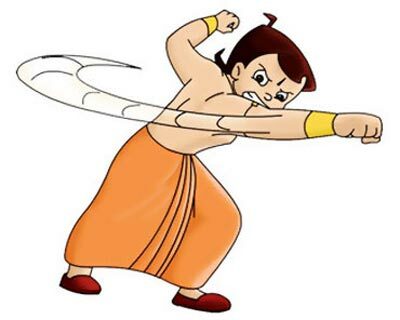 What do you think would be a good performance for Chhota Bheem on the big screen? For us, this is the first attempt. Our fingers are crossed. I understand that we can make some rooky mistakes in a theatrical. We are not saying that we are perfect. This has been a very big learning for us. In the next movie, we are looking forward to going to a much higher level, with high budgets, make a large movie. In terms of success and failures of an Indian animation film, I think every film is different. Ultimately, you need that first movie which breaks the barrier. We somehow think that Bheem can do that. If Bheem succeeds it is good for the entire Indian animation industry. Chhota Bheem vanquishes all his enemies and the baddies on screen. But is he going to have some real competition from within your own stable? Chhota Bheem has given us a phenomenal break. Today it is easier for us to convince the channel and other partners we are working with, about animated shows. The next few big things we are working with are Mighty Raju on Pogo. We made Mighty Raju a superhero and it is set in the modern era. While Bheem is about Indian culture, traditional values and strengths, local food and so on, Mighty Raju is all about patriotism and one's country and heroism. The two shows complement each other. We think it is going to be the next big thing. Besides, we also have Luv Kush on Disney XD, Chor Police on Hungama. These two shows also have high expectations. Especially Luv Kush, we are planning to work more closely with Disney to make it bigger. We never actually know what the audience really wants, till it happens, so I hope these shows do work. And they lived happily ever after? Not Quite!